APRIL 8 – 18, 2019 Sorry, this trip is full; check back next year. Knitting, Weaving, Machu Picchu, and Lord of the Earthquakes Procession in Cuzco. (Arrive on April 8, fly home late on April 18 or early April 19) This exciting 10-night textiles and Machu Picchu adventure goes from the superb museums and gourmet restaurants of Lima the capital city, to the Andean highland villages – with the jungles of Inca Machu Picchu, and beautiful colonial Cuzco in between! Either Cynthia, or BTSA assistant Gerardo, or the hotel driver if after 10 pm, will meet you at the Lima airport upon arrival, on April 8. 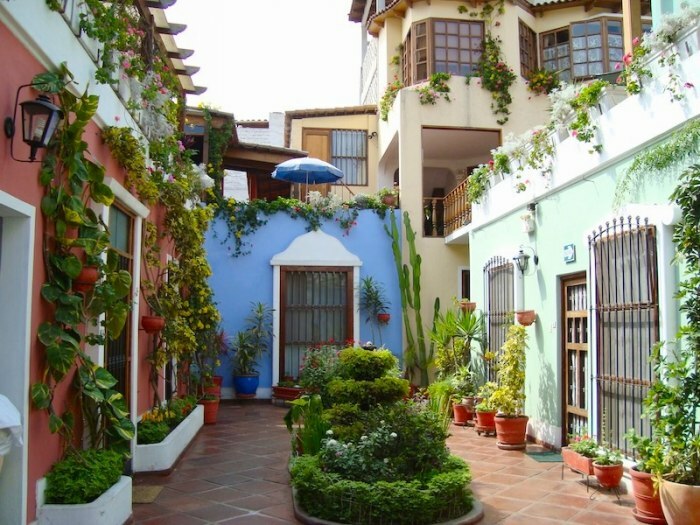 Check into the Hotel El Patio, below, for a good night’s sleep in this charming and cozy place that is overflowing with flowers and greenery, in the upscale Miraflores neighborhood. El Patio Hotel in Miraflores, Lima. In the morning, after breakfast in the hotel’s downstairs breakfast room, we will have a brief orientation about seeing textiles and Machu Picchu logistics. A friendly money-changer will come to the hotel lobby to change our crispy clean, new dollar bills to soles, the Peruvian currency. Cynthia will hand out currency conversion charts to use until you get used to the money exchange. The van driver will pick us up at the hotel to begin our adventure in Lima, Peru’s bustling and prosperous capital city. Lima has world-class museums, flowery parks, interesting architecture, a fabulous crafts market, and great restaurants where we will sample typical Peruvian cuisine. We’ll spend a very full day in Lima, first seeing the wonderful ceramic and textile collections of the Rafael Larco Herrera Museum, housed in a beautiful old mansion with flowery gardens. It has just been renovated and the presentations are superb, but we still love the storage section with the floor-to-ceiling glass shelves of mostly Moche ceramics, like a huge library of pots, all carefully arranged and grouped by subject, crab pots, squash-shaped pots, llama pots, etc. After lunch, we’ll go to the recently revamped Amano Museum which has one of the world’s best Andean textile collections; there we will meet the Curator if he is in town, and hear his story of the museum’s evolution to its present glory! Our Welcome Dinner will be at one of Lima’s many excellent restaurants. Machu Picchu from the back left side. Next day we fly over the Andes to Cuzco, and from the airport, drive to lower altitude. We’ll spend the night in a pretty hotel in Ollantaytambo, in the Sacred Valley. In the little shops and the handicraft market there, we can look for interesting textile finds or you can climb to the ruins of Ollantaytambo. Early next morning, we’ll take the train to the incredible, mystical site of Machu Picchu. The ‘Sanctuary’ site was overgrown by trees and brush but known by the local people, when American Hiram Bingham re-discovered it in 1911. An expert local guide will accompany you as you walk around the site, and will explain the Inkas and their culture. 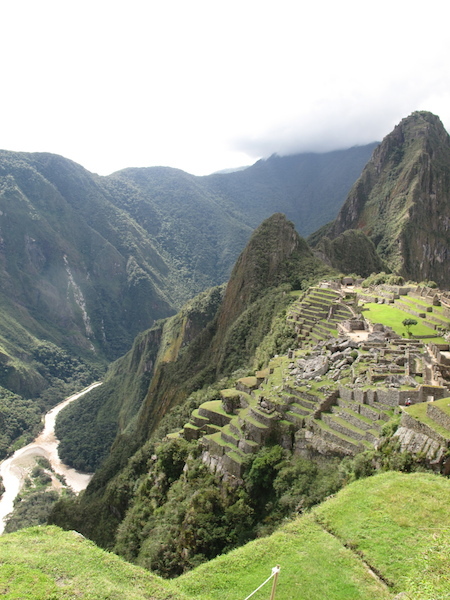 Machu Picchu (now a National Park) and Cuzco town itself are both UNESCO World Heritage Sites. Machu Picchu is lower than Cuzco and the environment is very different. Rock cliff faces bristle with bromeliads; orchids and begonias line the sinuous road to the site. That night we’ll sleep to the roar of the Urubamba River and visit the Inka sanctuary again the next day, if you wish. 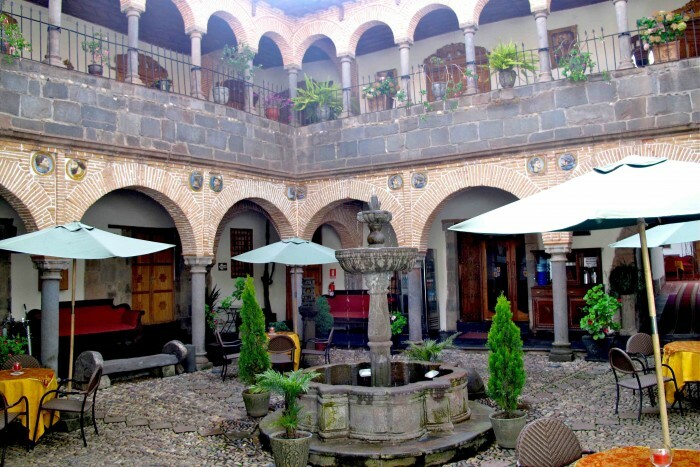 Patio of our heritage hotel in Cuzco. 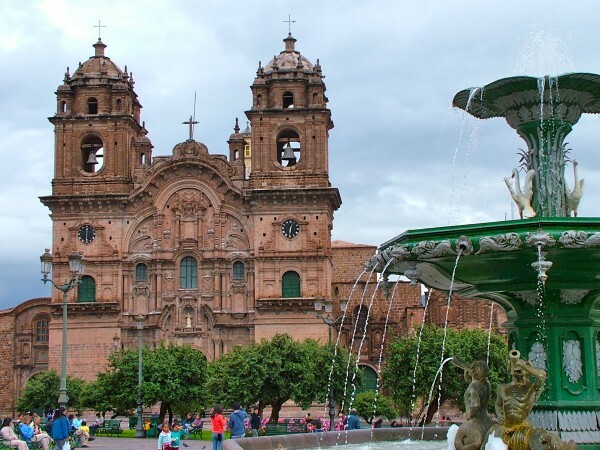 Our return train journey to Cuzco will be in the afternoon on the second day. Upon arriving in town, we’ll check into our historical hotel, a beautiful stone Colonial mansion built in the 17th century, and restored in 2004. The hotel is in the perfect location, on a quiet side street two blocks from the central Plaza de Armas, and close to many other historical sights. Weaver picking up warp patterns with llama bone. Cuzco was the center of the Inka Empire and you’ll see Inka stonework at every turn around the central Plaza de Armas. We’ll take it easy the first day in the altitude, walking nearby to have lunch. 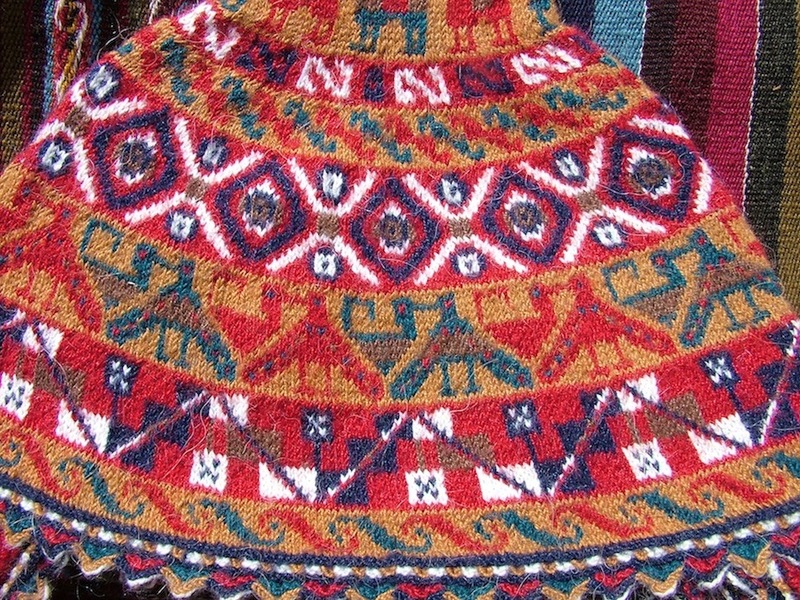 Then we’ll visit the good exhibition at the small museum of the Center for Traditional Textiles of Cuzco (CTTC), founded and managed by dynamic Peruvian weaver Nilda Callañaupa [English-speaking]. Cuzco is safe and easy to walk around in, mostly flat cobblestone streets, with some hilly areas. From Cuzco, we will drive to several remote Andean communities on day trips (coming back to our wonderful hotel, above, to sleep). 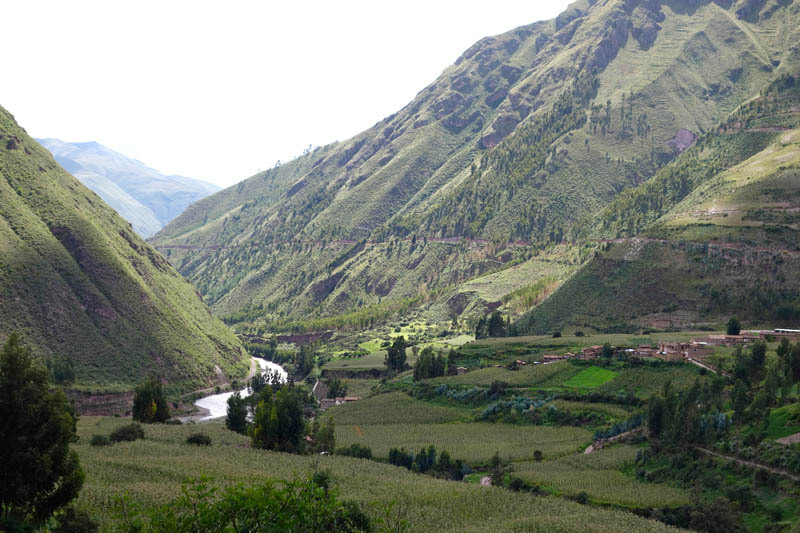 Sacred Valley of the Inkas with terraced hillsides. In the villages, you’ll meet textile artists and will be welcomed to learn some new weaving or knitting techniques from these masters. One day, we will have a dye workshop in a village with the women there. 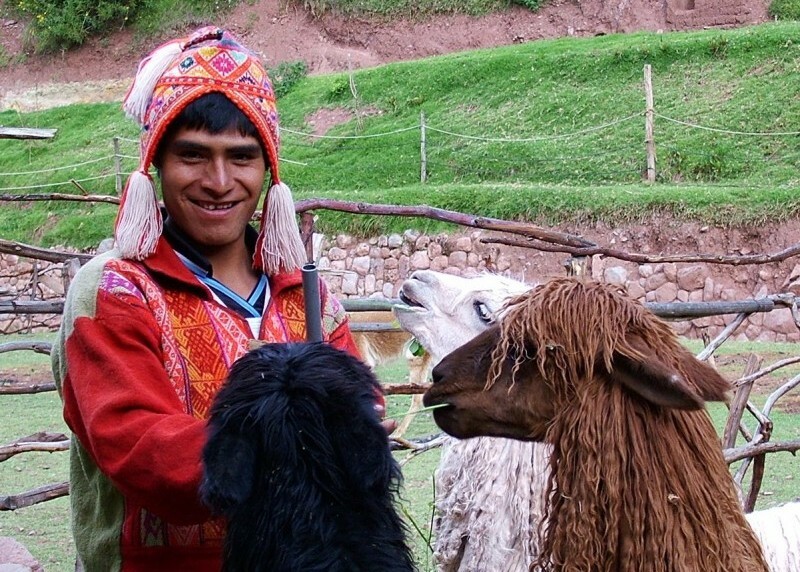 You’ll buy white alpaca yarn at the Michell Alpaca store, close to the hotel, and we’ll dye it with natural dyestuff such as cochineal, yellow flowers, green leaves, and more. (You can buy/dye as much yarn or as little as you want.) This day is market day in the village too, so you can check out the little local market, now as full of tourist souvenir textiles as local produce. We will also visit Nilda’s brother’s studio; Angel paints charming watercolors depicting various animals from local myths and legends, such as foxes and mice. These sweet and original souvenirs are for sale at his studio. 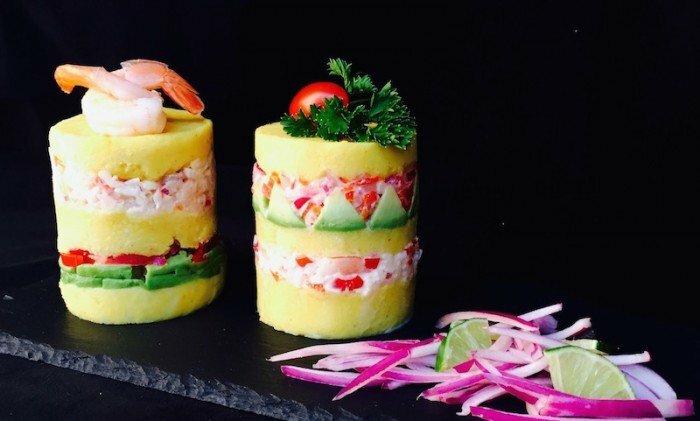 Causa, typical yellow potato cold dish with crab, peppers, avocado. Monday afternoon is time for the fabulous procession of the black statue of Christ on the cross. We will have good seats in a restaurant above the plaza to look down on the celebration, take photos, and to toss the symbolic red flowers onto the statue as it passes below (for blessings and luck). Note that in the photo at top, the base of the figure is covered in red flowers. Feeding some very hairy creatures! The procession includes several priests, deacons, and perhaps a cardinal, military marching men in uniform and brass bands, city dignitaries, school children, and college students. By the end of the long celebration, the participants are all sprinkled with red flowers thrown from balconies along the route. We’ll have our Farewell Dinner in Cuzco the last night, then next morning on April 18 (breakfast only included today), we fly to Lima, and either connect onward to home that afternoon/evening, or go to the Hotel El Patio to rest and perhaps shop in the neighborhood until time to go to the airport. We will suggest convenient flights for arrival and departure. * To sign up, click this Sign Me Up! link and follow instructions. All meals, breakfast, lunch and dinner– except two lunches and one dinner on free days, when group is scattered. 10 nights accommodation (April 8-17) in beautiful, small boutique or heritage hotels, all locally-owned, safe, and friendly. Private bath, double or twin occupancy. Two interior flights (Lima to Cuzco round-trip) one hour each. Day Room on April 18 until you depart for the airport which may be in the wee hours of April 19. Explanations by Cynthia, on woven ancient/pre-Hispanic and contemporary knit/woven textiles. Knitting workshop to learn ingenious knitting techniques; yarn provided. 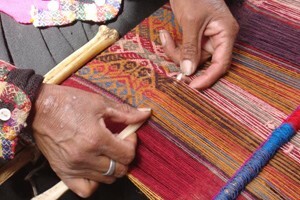 Peruvian Master Weaver, Nilda Callanaupa to accompany group for Andean village visit. All interior transportation by private van with professional, known driver. Bottled water on van rides (please bring a refillable bottle for personal use, or re-use one there). Visits to typical, remote Andean highland villages to meet the textile artists; picnic lunch in a village. Entrances to all museums on itinerary of Textiles and Machu Picchu tour. 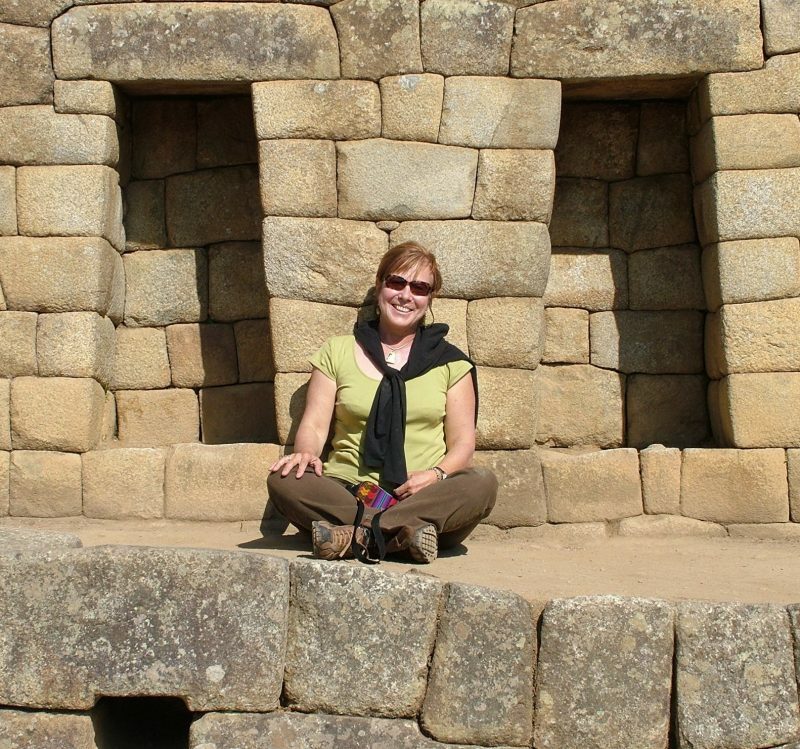 Licensed, professional English-speaking local guide and guide tips for Machu Picchu. 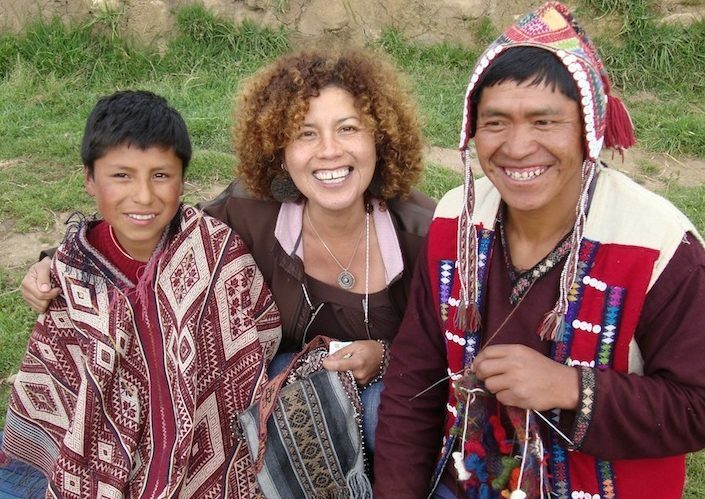 Andean textile expert Cynthia LeCount Samaké and a Spanish-English-speaking assistant to lead tour and accompany entire itinerary. 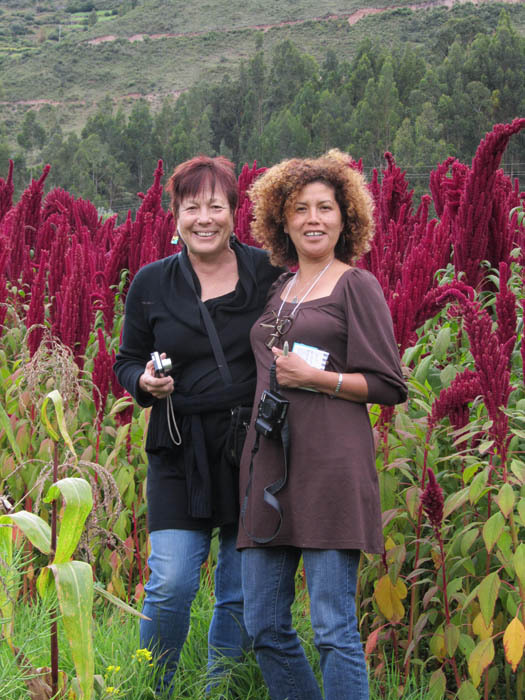 Cynthia and Claudia in a kiwicha field, Chinchero highlands. 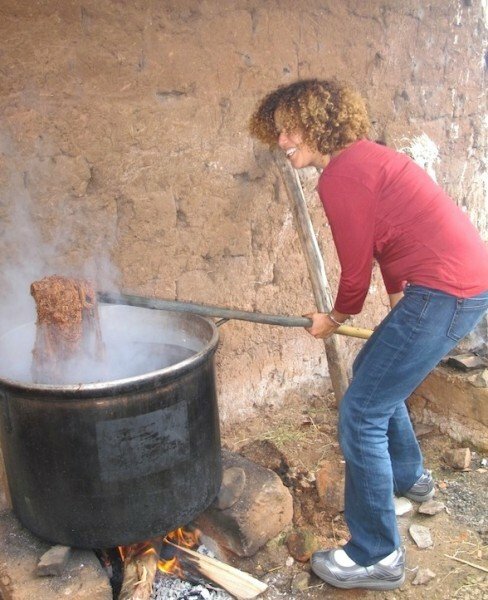 Claudia dyes alpaca yarn with rock lichen. Chinchero.